If organising a hog roast for a private event, Mexican hog roasts are a superb idea, helping the enhance the party vibe with a blend of flavours. This is something you can incorporate into your entire menu from the starters and sides to the hog roast itself. Think nachos to whet the appetite, tender hog wraps and bean salads on the side. Everything from guacamole and sour cream to salsa and chilli go perfectly with hog roast dishes. A Mexican twist is a great idea for Summer parties, informal events, when you want to add some spice to your menu or your event theme includes vibrant colours. Who doesn’t love delicious Italian food? From tasty Mediterranean vegetables and sundried tomatoes to cured meats, freshly made dough and feta cheese, their menus are always packed full of flavour. That’s why it’s a great idea to add an Italian twist to your hog roast menu. An antipasti starter will go down a treat, allowing guests to put together a small plate of cold meats such as prosciutto and salami, together with breads and grissini (Italian breadsticks). Your hog roast can be rubbed with some authentic virgin olive oil, as well as Italian herbs and spices to create those flavours we know and love. You’ll only require some simple side dishes to complement the flavoursome meat. Why not add roasted vegetables and salads which will enhance the taste of the hog? You can even keep the theme going with tiramisu for dessert. Perhaps you love the thought of a traditional hog roast, feeling it doesn’t need anything extra, but you want to ensure your entire menu has a gourmet vibe throughout. You can achieve this is through your side dishes which can make the difference between a hog roast which has everyone talking and one that’s missing something. One of the simplest ideas is allowing guests to build their own hog roast plate, including home-made coleslaw, fresh salads, potato salads with chives and mixed vegetables. However, to add a truly gourmet twist, one of our favourite ideas is roast potatoes seasoned in garlic and rosemary which have been cooked in the juices from the pork. This technique produces one of the most delicious tasting sides you’ll find to go with a hog roast. 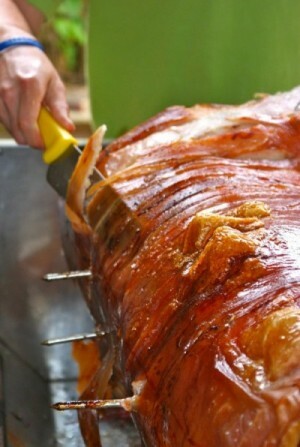 If you’re planning an event and are looking for hog roast caterers, look no further than the Gourmet Hog Roast Company. We have some great ideas for your menu if you need them, so just speak to our team about what you have in mind. For hog roasts in London and the South East, get in touch now. Categories: Hog Roasts and Party Idea.